Black and white photograph of a silo for coal. Bernd and Hilla Becher collaborated for over 40 years, first working together in 1959. 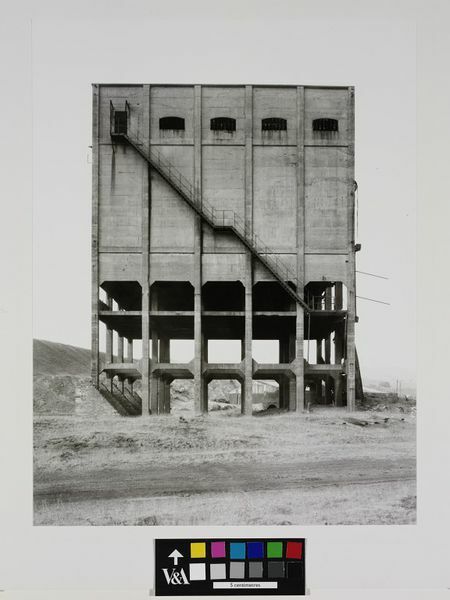 Their systematic photography of industrial architecture brought them recognition as conceptual artists as well as photographers. 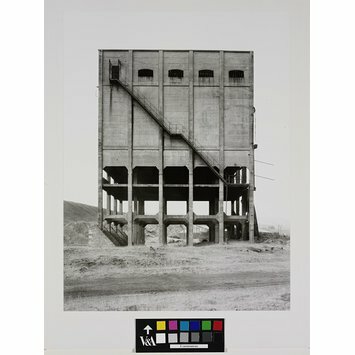 With a deliberately impersonal style, they catalogued and compared the functional yet sculptural forms of steel mills and mines. The Bechers devised a system of ‘typologies’, arranging particular types of buildings in grids. They used a 10 x 8 inch large format camera to obtain detail and worked on overcast days to avoid shadows.